For your weekend enjoyment, here's something I posted over on The Real Fitness Nerd. I shortened to title of the latest study to blast our soft drink habit to make more colloquial sense. A Greek study showed that people who drank between two and nine liters of cola could suffer muscle problems, from minor weakness to serious paralysis. Yet more bad news surrounding the world's number one source of calories. Really, people were having issues from drinking on two to nine liters a day? Shocking. And y'all thought Denis was exaggerating about how much Red Bull Americans drink. The two examples used in the article drank three and seven liters of soda a day and suffered from muscular weakness, as well as appetite reduction, heart blockage, and persistant vomiting. Both were female. Well I'm no Greek scientist but it doesn't take a PhD to figure out one of these women was drinking more than 100% her RDA for caloric intake from cola. And, gosh, she didn't feel good on a diet with a primary component is all sugar, with zero proteins and fats?! Go figure. What this study concludes, more than anything else, is that people can withstand a massive amount of torture. It's really a testament to the human body that it can survive for so long while being poisoned daily. 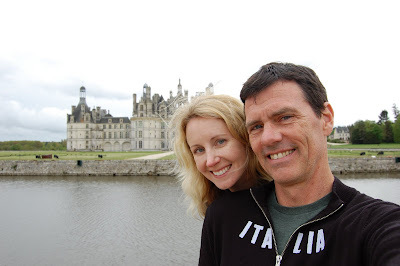 When I heard my friends Bruce and Alisa were spending a year in southern France and had a house with plenty of room for visitors, the only choice became which bike race to visit during. Like me, they’re both climbers turned cyclists, and there was no question that our holiday had to be during a race. Having been to Le Tour, the next choices were the spring classics or the Giro. Given Bruce was a cobble crazy as I was, we set our dates to include Paris-Roubaix, better known as the Hell of the North. The trip had originally been set up to include loads of training as my final prep for the National Championships at the end of April. Post injury, the schedule changed to include loads of eating and a recreational climbing & riding schedule to build up our appetite. But back injury or no, if I was in Belgium, I was going to have a go at some cobbles. Riding in Belgium, well, specifically Flanders, is amazing. Everything is set up around bikes. There are cafes, museums, bike shops (that are a lot like museums), and bike routes everywhere you go. All of them include stretches of famous bike races that take place on tiny rural roads. And almost all of them include cobbles. We had our choice of a stack of different classic routes, each marked by an artistic colored plaque. We began on the Ronde van Vlaanderen (Tour of Flanders) but once we’d had a taste of cobbles, we amended it to include the steepest and most famous sectors we could get to the quickest. On the longest sector of the day, we were passed by a guy hammering in his big ring. Bruce and I were quickly on him, my own curiosity being how it would feel to ride these things at race pace (the girls were having none of such nonsense). I was worried about my back, but after a kilometer of rattling along my vision was blurred, my head numb, and my hands, arms, and shoulders felt like I’d been going full bore with a jackhammer, so much so that I couldn’t be bothered to think about the back at all. Paris-Roubaix includes over 100k of cobbles. We’d just raced one. The horror of that race is so acute that I absolutely must come back and try the amateur version of it sometime. The Koppenberg was, by far, the hardest climb we did. It’s not even 500 meters but the cobbles are uneven, wet (I’m sure they never dry in Belgium), and hit an angle of 20%. I quickly realized why there were so many pics of pro racers walking up these inclines. It wasn’t that they couldn’t ride them. It’s just that they’re so steep and rutted that anything causing you to lose you line or change cadence might force you off your bike. And in a pack these things are constant. And once off your bike you can’t remount, so you’re best off to just run to the top and get back on. You’re not riding that fast anyway. Well, at least not on the Koppenberg. For our next ride we scanning the distances and grades of the cobbled climbs and choose the Muur de Geraldsberg as one that looked the fiercest. Cobbles for 1.3K that hit 19% promised to be horrible, so we tooled around at a pedestrian pace for most of our ride so we wouldn’t burn out all those fast twitch fibers we’d need to ride all the way to the Muur’s famous summit church. Turns out that cobbles aren’t created equal. Those on the Muur are smaller and closer together. Not only could we ride it but we could hard. On a subsequent ascent, in my big ring, I could hardly imagine how fast Divolder must have been going on these narrow roads to drop everyone, as he had done a week prior en route to winning the Ronde van Vlaanderen. Food and beer are at least as important in Belgium as riding. And, of course, there’s a pub at the top of the Muur. We recovered with Frittes and “the world’s best beer” (according to our waiter), and contemplated if Heaven was just a bit like Belgium. 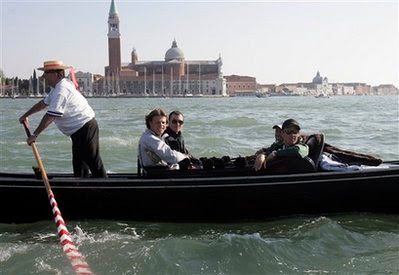 The Giro is featuring some exciting and brutal racing. It may not be a traditional grand tour this year but I'm in total agreement with this perspective. The virtually Giro has turned more into a prep phase, but given it's the first block of the 90-Day Challenge, that's what it's really supposed to be. The pull-ups and all the climbing had aggrevated my elbow, so I'm in full and agressive rehab mode and I'll post that program if it works. Yesterday it rained, postponing climbing plans and giving me a serendipitous rest day. Well, not rest exactly. It is the virtual Giro, meaning that I needed some aerobic training. 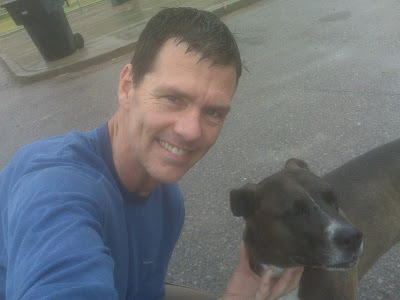 So besides my rehab and core work, B and I went out to explore some new trails in the mud/rain. Good stuff. Since my blog is all about fitness n’ stuff, I’ll leave it to my wife’s wit to recount our recent excursions. Here is part I of her journal on England. I’ll add a little fitness background on our Albion hosts, Todd and my brother. In the early days of Beachbody, Brian was one of my earliest test subjects. When we were designing X, we were putting our graduate members through about any combination of exercise and diet as they would stand (which was a lot, I might add). We experimented with amalgams of all of Beachbody’s products to that time, which led to some grueling training schedules. One of the craziest of the bunch was called “Cindy and Pixie’s Really Hard Program”. This became rather absurd in the latter rounds, with a schedule that made P90X look like a warm-up. Of note, the only two people not to finally drop off the pace were Brian and one other girl, who were the only two of the group using creatine daily—a nice bit of anecdotal support for that supplement. Todd has been my partner on many an adventure, including the making of Icarus Descending. On a fitness note, he’s rather well known for his birthday challenges. 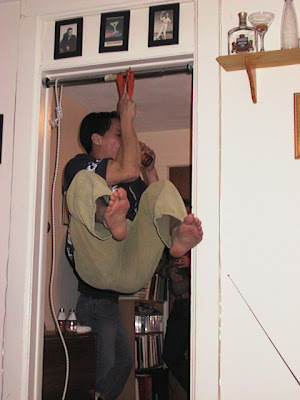 They include all sorts of bizarre feats of strength, such as locking off at the top of a two-finger one-arm pull-up and drinking a beer(pic), following probably the hardest bouldering circuit ever done at Devil’s Lake with a 32-mile run that stopped at 16 bars, where a shot of whiskey was consumed at each, and doing 716 pull-ups in an hour. I’m sore a lot, and I’m getting to like it. When I’m sore I know it’s because I’m training. And while it’s always possible to not be sore, it’s the only true indication that you’ve pushed your boundaries. Not being sore leaves questions about whether you’re training hard enough. Soreness leaves no questions. The virtual Giro is workin’ its magic. Increased time both in the saddle and running has me in a state of breakdown similar to last year’s X off the couch cycle. This extra work has allowed me to tone down my climbing training to allow my elbow to heal. Pushing on the tender tendon now induces only a dull pain. Another hard cycle is right around the corner. Having barely started running again it promised to double my longest run and add, oh, about 7,000’ more feet of elevation change. I probably shouldn’t have done it but it’s such an aesthetic loop, and practically in my backyard, that I just couldn’t resist. To offset my penchant for competition, I left late as to avoid any temptation. I must say, seeing a horde of runners stampeding (hmm, more like crawling or slithering, as there’s hardly a step of runable terrain) up the west face of Grandeur Peak was pretty cool. Beata and I joined in 20 or 30 minutes later and kept a steady and conversational pace throughout. It was also B’s first long run of the year and she was pretty cooked by the end, but happy to get some training in to defend her title at the Doggie Du. The morning was stellar and I finished with a couple of blisters but barely feeling winded. Seeing Mick’s time (like 3rd overall) made me exceptionally happy not to have started with everyone. He’s one of my main training partners and trying to keep up could have put some serious hurt on. I like to think I would have been restrained, but glad I didn’t put my patience to the test. As it was, I’m still hobbling around and will be on the bike for a few days. But it was a perfect test run. My back feels great, so do my knees, and my elbow. Definitely, I seem to be on the road back. pic: "you know, some people wouldn't think this was fun." b looking like a lizard slithering up a very steep game trail. Like the Texan tailing off in the Dolomites, I’ve dropped the pull-ups from my challenge. I have a twinge in my elbow and, though I’m rattling off pull-ups pretty easily, doing 100 or so a day is making it worse, not better. Like Lance, this virtual Giro’s aim it to train for other objectives. Anything that’s breaking me down to the point that there is no long term benefit is being axed. Training can only be called training if it succeeds in making you better. Other than that, the challenge is going well. The daily biking/running has me pretty sore. I’m going to swap rehab work for pull-up work since my back still isn’t 100%, nor is my elbow, and running/riding has one of my knees feeling slightly tweaked. 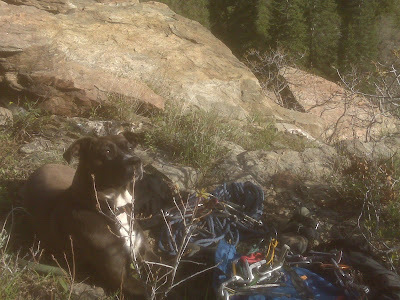 I have one “big” climbing day, so far, where I did my traverses into all of the existing routes in Deaf Smith (and even found a new project that should be dispensed with soon). But, like the Giro, there are bigger days ahead. vid: romney calls this guy “mozart on a bike”. inspiring, even if, like me, you'll never aspire to anything remotely like it. Normally my time in the office is spent working long hours where I’m barely able to squeeze in a few sets of pull-ups. With the 90-Day Challenge in full swing, this trip has been a little different. The gym is being used non-stop, the junk is gone from the kitchen, and everyone is walking around drinking Shakeology. On a previous trip, I’d made a bike swap with a friend which resulted in getting my old race bike back. 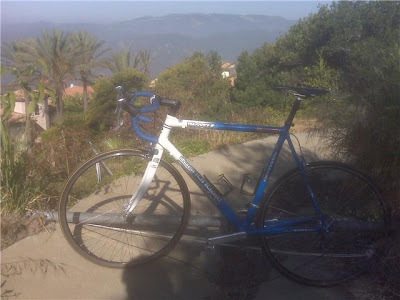 He needed a cross bike, and I needed something to leave in LA to commute and train on, so it made sense. Especially since this bike and I have a so many memories together. It was good to see her but, last trip, I never found the time to give ‘er a spin. This trip I had a schedule to keep, so I knew I’d get some saddle time, but I had no idea what was in store. After a long day filming for TBB, I got to Jon’s house with just enough time to dust her off, inflate the tires, and sample the local—very hilly—neighborhoods for an hour or so. It felt great to ride this bike again. The aluminum frame is harsh, but responsive, and the Open Pro wheels buffer a lot of the road chatter. Mainly, it was nostalgic to be back on the bike I’d begun racing on. The next morning, after a core/pull-up workout in Jon’s garage, we were back together riding on the terrain the used to make up my team’s morning workouts. A swing by the old coffee house led me through Tony Horton’s neighborhood, then through a commute that was very much like the one I did to the office way back when our only product was Power 90. Lunch hour arrived and I met Carl, Andrew, and Brian for an “easy” spin down to the beach, or so I thought. But Carl had other ideas and we headed towards the beach “hoping to beat my best time”. This resulted in a 55 minute time trial the left my legs feeling like concrete all afternoon. The commute home wasn’t hard enough, I guess, as I opted for some hills just to check out new routes for subsequent visits. The hills I remembered being “easy” were feeling mighty grim and I was cramping by the time I arrived back at Jon’s, just as he was finishing his evening workout. In the morning I was stiff and sore but headed out nonetheless. My Giro simulation for their final climb was Palisades Drive, which I never remembered as being so steep. It seemed like the last couple of miles would never end. But the views at the top were revitalizing, and on the ride home I barely noticed the little 20% berg getting up to Jon’s. I think 5 rides in under 36 hours is a record for me, and it’s certainly the most fitness-oriented work trip I’ve had. I think we might have to turn this 90 day adventure into a standard day at the office. pic: just like old times, looking out over the santa monicas. High Road upset Garmin by a scant 6 seconds today, putting the 23-year-old Mark Cavendish (England) into the pink jersey. Cav is undoubtedly the best sprinter in the world and will hold the jersey til the race hits the Dolomites in a few days. Twenty-three! Jesus! It's impossible to say what's in store for someone who's already at the pinnacle at an age where most pros are still aiming for U23 palmares. Unfortunately, my man Z didn't grab the jersey but it wasn't due to lack of style (see pic). But just wait. I think he's become more of an all around rider than people realize. We'll see, but I'm expecting a GC result from the up-until-now time trial specialist (and Utah resident) (and cult movie aficionado)(and all-around odd dude) (don't believe me just follow him on Twitter). My Giro simulator began on the eve of the event with my longest and hardest run since my injury, a foray up some weird game trail onto a beautiful ridge crest above town. Fell asleep with an aching knee and wondering about getting through even day 1 of my challenge. Woke up feeling awful. A handful of pull-ups and leg raises warmed me up for a dismal time trial up Mill Creek. 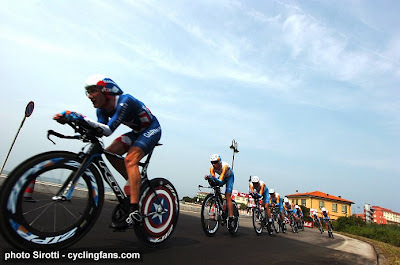 But, hey, it was one minute faster than last year's pre-Giro TT and my knee didn't hurt. Plus it was an absolutely stunning day. An amazing opera via Met HD broadcast (Elina Garanca is off-the-hook--we'd just seen her with Anna Netbrebko in London, but that's another story[shouldn't there be an acronym for this? BTAS]) had me rested for a trip with Mick up to Deaf Smith, where I traversed into all existing routes and sent them all except for one where I broke a key hold and, voila, have a cool new project. Finished with a fantasticly beautiful dinner that's still on the Bob diet, along with a most civilized addition of wine. Tomorrow, big day in AF planned. Life is good. Ah, the most beautiful of all bike races begins tomorrow, along with the next phase of my training program. I love the Giro, and think I post something stating this every year, but this year it’s more accessible due to the participation of one Texan. In fact, something like 12 Americans are lining up for the start and one, Levi Leipheimer, is among the favorites. My money would go on Italian Ivan Basso, but I looking for a surprising ride from the Z-Man, too. In fact, to see him in pink tomorrow night would be less than shocking. You can follow the race at all the usual media outlets but, mainly, check out Universal Sports will be broadcasting every kilometer on both the net and TV! So now I need to announce my virtual Giro, which isn’t going to be in the same scope as last years, at least I don't think. I have two long work trips that are going to make this challenging. But it’s supposed to be challenging, right? But in mimicking the Giro I also need to commit to something that follows the day in, day out, intensity of racing. I can’t follow their schedule exactly, but here’s what I plan to do. For the six mountain top finishes, complete six big climbing days (I haven’t had one yet this year). A big day consists of at least 100 boulder problems, 30 easy routes, 20 moderate routes, or 10 hard routes, or something grade IV or above. I’ll admit, this isn’t my most aesthetic virtual grand tour. But that doesn’t mean it won’t be challenging. Since it's a news site, and I've been asked to contribute, from now on I'll make my news postings there and keep this site more personal. I promise all my postings over there won't be so snide. I just couldn't resist blasting the "brain food" article in question a little bit. In my world, the Bob Diet is settling in and I'm getting used to it. But now Bob tells me he strayed a bit from being only akaline to low fat. So he ate some meat so he could cut down on the fattier not-so-acidic items, like nuts and avocados. So I may push this, slightly abridged, into a second, and maybe a third, week. Virtual Giro gets announced tomorrow. Still not sure what it is but it's going to be really hard. For anyone planning to join me (Reed? ), it'll probably be to train a percentage of time the lads are racing that ramps up each week. So clear some room on the final week of the race. Most recreational athletes I know spend their lives in a perpetually overtained state. This is due to two things. First, we tend to think we’re copping out when we slack on our schedule. Second, we tend to be manic to the point that we need to train or our lives feel out of balance. To train effectively, both of these tendencies need to be overcome. There are countless examples of athletes (recreational and pro) who have reduced the amount of time they spend training and improved their performance. Just yesterday, in fact, I read an interview with professional climber Yuji Hirayama, who just climbed his hardest route at age 40. He said that he doesn’t have as much time to train and climb as he used to and the result is that he’s getting stronger, and climbing harder, than ever. The best example of this I’ve seen came from Tony Yaniro back in the early 90s. Climbers back then, myself included, tended to train like headless chickens (as well as not eat, but that’s another story), resulting in massive plateaus if we were lucky and injuries when we weren’t. Yaniro—who had a few world-standard ascents in his day—published a workout plan without a set schedule. Each day had a planned workout that began with a lengthy warm-up. At the end of the warm-up, he would assess whether he felt recovered enough or not to proceed. If he felt recovered, he trained. If not, he cooled down and took a recovery day. Surely, this type of schedule would wreak havoc with us trying to train around busy schedules. If you’ve moved your appointments, kids, etc, around a time slot then, damn-it, you’re probably going to train. But that doesn’t mean it’s what you should do. Yesterday, when the weather cleared into a beautiful afternoon I became psyched to get outside. I’d actually planned some recovery but my somewhat tender elbow felt fine and I thought about one more hard day before my recovery began. 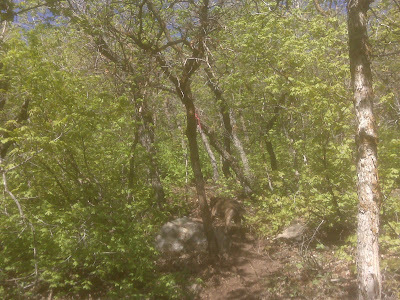 My mindset began to change when I felt lethargic on the hike in. My warm-up left me feeling ready… for a nap. So I bagged the planned session and spent some time scampering around the mountains with Beata at a leisurely pace, scoping the protection possibilities on a line I’d like to climb, and relaxing in the afternoon sun. Training day accomplished. I've been asked to do more gear reviews on this blog so I'm going to begin by reviewing a company. Oboz, a new outdoor footwear company, located in Bozeman, Montana, is getting my vote for who to buy your light hiking shoes from based solely on their company philosophy. They also make trail runners, but I'll wait until I've run in their latest model to comment on them. Oboz was founded on a different sort of philosophy than the standard corporation. Instead of aiming at massive profits, they are focusing on lifestyle and community involvement. For example, their office runs on 100% wind power and they plant a tree for every pair of shoes they sell. "Every day and every pair of shoes means another tree will be planted in a far corner of the world where trees are absolutely needed and treasured," said Oboz founder John Connelly. They've also recognized powder days as national holidays. How can you not embrace that? Things ramp up a bit this week. Last night I filled the fridge with fruit and veggies, while Romney added some raw dairy products, sprouted cereals, and such. Along with Shakeology this will make up most of this week's diet (cleanse, actually, as it's only 5 days so it's not really a diet). Finished last week off by getting on a 13a and 13b yesterday. I did neither but both are far easier than my project, so they'll go on the list of training routes to gauge my progress. Now I'd better get to some serious weight shedding! I need to get so much stronger it's ridiculous. This week will be a recovery week so far as climbing goes, while I ramp up my other training a bit. But with the reduction in calories it's going to be a lot of low-level training, gearing up to some sort of simulated Giro beginning on May 9th. Still don't know what this is going to be as I'm assessing what kind of stress my back can handle. It was tired after our trip, but I was tired after the trip. Now that I'm settled in I'll be able to address it properly. More people have been joining in the challenge each day. Very cool. Romney started her challenge today. She was out the door at 5AM and has something else slated for this evening. She seems to be taking the gung ho approach to my slow and steady. Hey, whatever works is always the best option. With phase one of the program being just starting, phase II will ramp it up a little with the Bob diet. My friend Bob went on an “anti-acid” diet and lost 10 pounds in the last 30 days. And he was lean to begin with. It started because he was having some digestive issues. His doc asked if he consumed much coffee, alcohol, and spicy food to which he replied “it’s pretty much my entire diet.” After 30 days of a high alkaline diet he says he doesn’t feel a lot better, though the acid-reflux symptoms are gone so he’ll probably stay on a modified version. But he did lose a lot of weight, so I’m down. Essentially, our diets tend to be overly acidic, which is primarily because we eat too much junk and not enough fruits and veggies. You don’t want a high alkaline diet all the time. You want a balanced diet. Your body regulates your blood pH levels so that they’re neutral, but when you consume too much acid this process does a lot of tissue damage. This was something that we never had to worry about before fast and convenience foods became a way of life because everyone ate some fruits and veggies, or at least live foods where the enzymes and bacteria weren’t all destroyed, out of necessity. Kudos to Bob’s doctor for recommending a dietary change instead of a medication. Of note, Bob’s climbing has improved because he’s lost weight. His endurance sports, not so much. He did a paddleboard race on got slaughtered, as he hit the bonk pretty much out of the gate. As I pointed out in my post on the Diet Switcharoo, you’ve got to eat to fuel your endeavors. Given my training will ramp again at the start of the Giro, this is essentially going to be a five day cleanse for me. Monday through Friday of this week I’ll eighty-six alcohol, coffee, sugar, meat, dairy, nuts except almonds, tomatoes and chilis, legumes, processed grains and breads from my diet. Since I don’t have acid reflux this is all in the name of self-experimentation. Science is a cruel mistress. pic: bob and his trademark oly.